Spring begins in only a few days, and while the showier spring ephemerals won’t be up for at least a month there should be some buds breaking in the coming weeks. Skunk cabbage is already blooming in some places, and soon some of the following should be emerging. 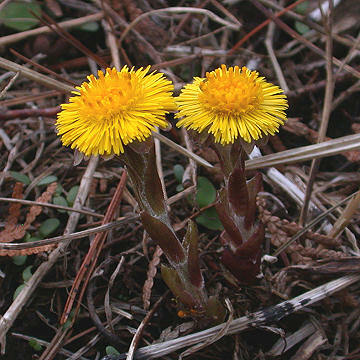 Coltsfoot (Tussilago farfara) sends up its dandelion-like flowers before its leaves. It is a native of Europe and Asia and has naturalized throughout North America. It has been used medicinally as a cough-suppressant but there now evidence that a chemical constituent of the plant is a powerful mutagen. It is typically found in disturbed areas. 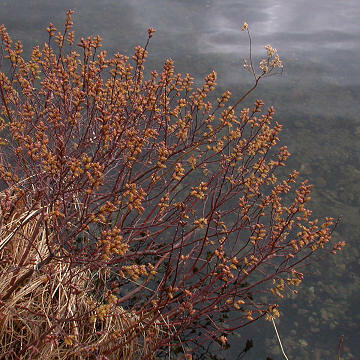 In wetlands one may find Sweetgale (Myrica gale) blooming in early April. This plant associates with nitrogen-fixing bacteria and the crushed leaves smell much like bay leaves. It is in the same family as Bayberry (Morella pensylvanica), which has fragrant berries that have been used to make candles. In moist woods of Central New York one can find Spicebush (Lindera benzoin), a shrub with fragrant leaves and orange or red berries that ripen in the fall. 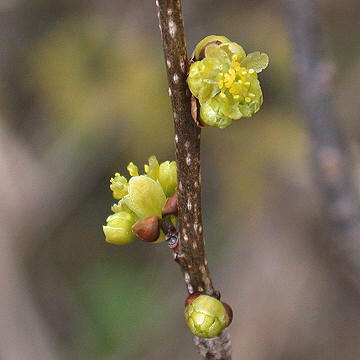 The floral effect of Spicebush is reminiscent of Forsythia but not quite as showy. It is the larval food plant of the spicebush swallowtail. I heard about that Coltsfoot that used as cough-suppressant. It just implies us that no matter how small or big a thing is, it has its own benefits to give. I’ve never found the Myrica gale and now that I know when (and maybe where)it blooms, I’m making a search tomorrow.